The Thermac, an energy saving operating louvre, is suitable for vertical mounting into sidewall cladding, glazing and brickwork. Each unit incorporates polyurethane insulation within the double skin louvre blades as an energy conservation measure. Additionally units are fitted with pile draught sealing strips which engage with the louvre blade sides in the closed position to reduce draughts and daylight penetration to a minimum. 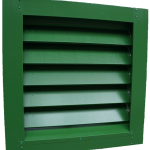 Designed as a source of controllable ventilation for mounting in side wall situations, the unit offers the added benefit of an effective barrier against valuable heat loss when in the closed position. Installations of these units may be used in conjunction with roof ventilators to provide an overall system of natural ventilation and may be installed singly, in horizontal runs, or in vertical tiers. The louvre blades contain 30mm polyurethane insulation, having a ‘U’ value of 0.6W/m²°C. Each blade is connected to side mounted link arms to ensure positive opening and closing of the units. Water repellant silicone treated polypropylene pile draught seals mesh with the blade end flanges to reduce draughts and daylight penetration to a minimum when the unit is in the closed position. Louvre blades pivot on maintenance free double nylon bearings. Forms an effective barrier via adjustable pivotting through to the closed position. 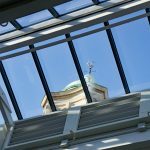 Units can be specified to have louvre blades adjustable to any position between fully open and closed to give infinately variable amounts of airflow. See table below for measured free area percentages (free area co-efficients). See table, can be banked together to suit any requirement. The box depth can be located inside or outside the building line as required. 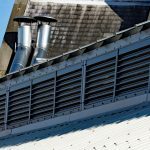 The louvres can be spring loaded to either open or close. Expanded metal bird guards, security guards or fly mesh can be fitted internally or externally if required. Where units are supplied for mounting in horizontal runs jointing plates are supplied for weathering. Pneumatic single acting with spring return or double acting to suit your requirements. Electro-magnets these retain the louvre in the closed position until de-energised by remote signal. Units fitted with electro-magnets require manual resetting. Electric actuation in ac or dc, & in voltage to suit your requirements. Fusible links – alternative temperature rated links are available.